The e-commerce giant has pledged 10 billion yuan (US$1.5 billion) to a new poverty alleviation fund and is enlisting the help of its business partners and employees. More than 30 Alibaba partners joined hands to unveil the company's US$1.5 billion poverty relief fund in Hangzhou. 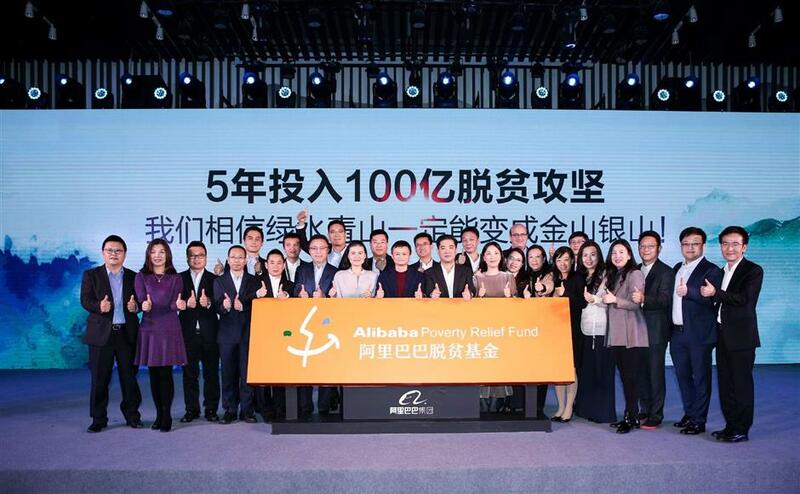 Alibaba Group pledges 10 billion yuan (US$1.5 billion) of poverty relief fund and to make poverty alleviation a company-wide strategy that requires the participation and contribution from every single associate company and employees. "Poverty relief will become a key strategy of the Alibaba Group,” chairman Jack Ma told reporters today in Hangzhou. “We believe the end of poverty is a goal that can be achieved and our fund embodies our long-standing commitment to give back to society,” said Ma, who will personally chair the new fund. Ma said he wants Alibaba’s strong talent pool and technology resources to serve society, not just create more profits. The recent 19th National Congress of the Communist Party of China reaffirmed the nation's target to eliminate poverty by 2020 to achieve its goal of a moderately prosperous society. In the next five years, Alibaba will release half-yearly reports on its poverty alleviation projects. Each of the group's units must also develop and execute their own initiatives. The fund will focus on education, rural healthcare, empowering women and environmental protection. Ma also wants all of the group's business partners to take charge of a charity project and release half-yearly reports on their progress. Alibaba's 36 partners and its employees will contribute to the fund, as will the Alibaba Foundation, which was established in 2011 and receives 0.3 percent of the group's annual revenue to support the company's corporate social responsibility obligations.